Residents of the quiet neighborhoods that surround Arlington’s urban villages have a very peculiar relationship with the automobile. At least, that’s the conclusion one could draw based on citizen input at a Lyon Village community meeting that focused on parking and street-related issues. 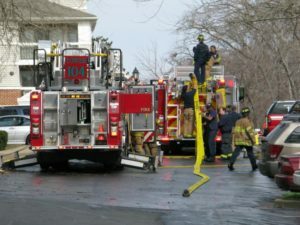 Residents are quite opposed to the county taking away parking on one side of narrow neighborhood streets to allow fire engines and garbage trucks to operate safely. But they also want more zone parking to keep outsiders from parking on the same streets. And at least one gentleman wanted folks who rent houses to have their street parking limited to just two cars. Residents expressed indignation that their streets weren’t plowed during snow storms, making navigation treacherous. Then some asked if there was any way streets could be closed to through traffic. One man earnestly suggested quadrupling the number of speed humps and lowering the speed limit to 15 miles per hour. In short, when it comes to cars, some residents want things their way and want others to stay on the highway. Lucky for them, Arlington County seems perfectly willing to listen and respond to their requests. Last night Arlington County Director of Transportation Dennis Leach and Traffic Engineering and Operations Chief Wayne Wentz sat down for a 90 minutes discussion with about 30 residents at the Lyon Village Community House. 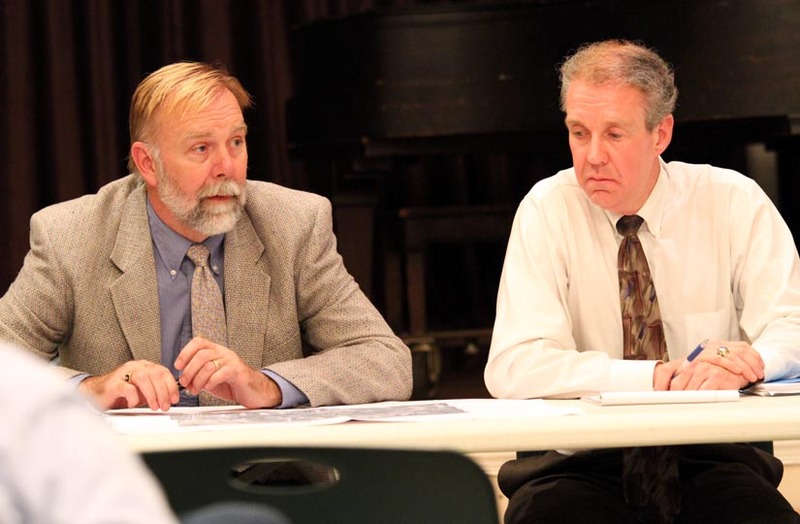 Although the meeting was ostensibly about street parking, all manner of street-related issues were brought up. 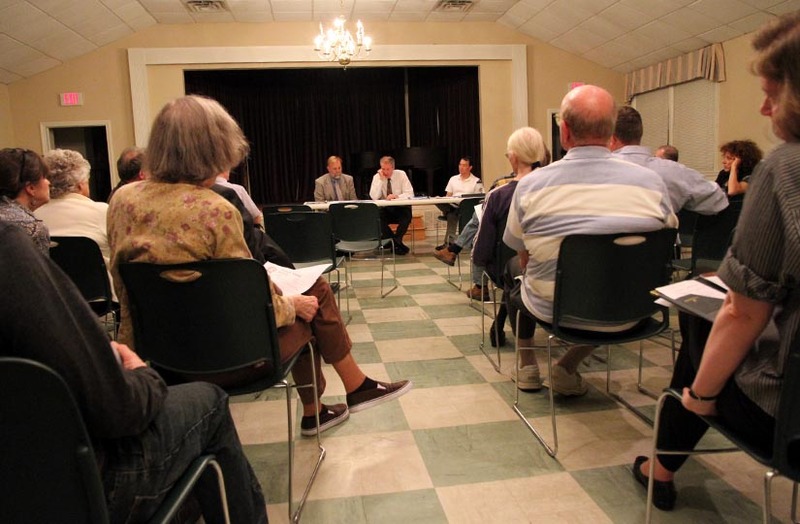 The meeting was attended by Lyon Village residents and by representatives of other local civic associations, who are worried about the county’s recent move to restrict street parking on certain narrow streets. Wentz and Leach explained that while the county is not actively looking for narrow streets, one complaint about a street’s width — from the fire department, a garbage contractor or an anonymous resident — is all it takes for county staff to be sent out with measuring tapes. They will visit a street several times, on different days and at different times, to study parking utilization. 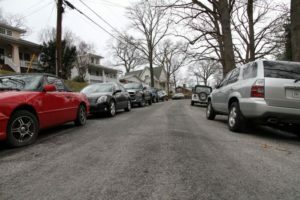 If the street is less than 28 feet wide and heavily parked on both sides, parking restrictions will likely be recommended — although first the county will notify residents and initiate a neighborhood discussion about the changes. There have only been five complaints so far this year, Wentz said. In response, the county has studied part of Edgewood Street in Lyon Park and parts of 18th, 20th and 21st, Harvard and Hancock Streets in Lyon Village. 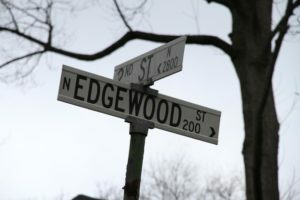 Wentz revealed that of those, some parking restrictions will be implemented on Edgewood Street — which has been the subject of extensive debate — and on the curvy stretch of 21st, Harvard and Hancock Streets north of 20th Street. The others will not be changed. But this is not to say that Arlington discourages narrow streets. To the contrary, Wentz said that it’s county policy to encourage “yield streets” — streets that are so narrow that only one car can get by at a time. But that policy only goes so far, Wentz said. The road still needs to be wide enough for fire trucks to respond to emergencies. “The question really comes down to the basic functionality of these streets,” he said. Wentz was pressed several times to say how many times fire trucks have responded to emergencies on the particular streets his staff measured. “You’d have to ask the fire department,” he finally said. In lieu of permanent parking restrictions, is there any way to put up temporary no parking signs during leaf collection and snow emergencies, Wentz was asked. “There’s no way county staff could accomplish that” countywide, he said. Another resident asked: Why are parking restrictions just being put in place now, when the streets have remained the same width for decades? “Car ownership patterns have changed overtime,” Wentz said. “Car ownership has gone way up,” and the more people parking on a narrow street, the worse the problem. To address that problem, county administrators adopted a set of “Residential Street Width Guidelines” in March 2008. Those guidelines — which specify that 20 foot or narrower streets should have no parking, streets between 22 and 27 feet should have parking on one side, and streets greater than 28 feet can have parking on both sides — have only recently started to be enforced. Some residents expressed surprise that only one complaint could trigger a street width investigation when numerous complaints were not able to summon snow plows over the winter. “I had no idea you could get that kind of action with only one complaint,” one man said. “There are lots of parts of the county government that are structured to respond to resident concerns,” Leach explained. But between the anonymous complaints and the unquantified number of fire responses that require wider streets, Lyon Village Citizens Association President H.K. Park was unconvinced of the wisdom of restricting parking. Lyon Park Citizens Association President Natalie Roy agreed. “It is just a matter of time before more complaints are being made about narrow streets all across the County,” she added.